The International Office has also had to move now that the D Building is about to be rebuilt. Since the end of November, the Division has been located in the HusEtt Building and in the Zenit Building. The HusEtt Building, the red wooden house behind the A Building where the Emeritus Academy has been staying for a while, lies beautifully embedded among trees and bushes wrapped in frost, and looks a little like a Swedish Christmas card. Here, on the second floor, the larger part of the International Office has been located since the end of November. “It’s cosy and the offices are actually better than our previous ones in D Building,” says Karin Gibson, head of the International Office. 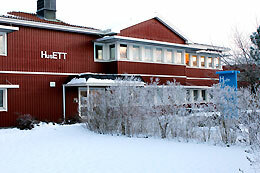 The entire International Office has not moved to HusEtt; four employees work in the Zenit Building with together with Student Health and the Student Information and Guidance Unit (SIV in Swedish). “They’re the ones receiving many students, and we also add extra staff during the start of term,” Ms Gibson says. "It isn't possible to receive so many people simultaneously at HusEtt, including for reasons of fire safety." The International Office will remain lhere up until the new Valla Student Building is finished in three years, at the beginning of 2019.